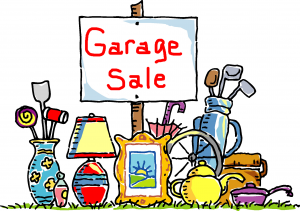 Save the date for the Spring Community Library Garage Sale in the library parking lot on Saturday, March 30th from 7am to 1pm. Book a space and we’ll send lots of customers your way! You KEEP all your profits! Let the FOL help you de-clutter this Spring! If you have things to donate, give those extra items to the FOL booth for our fundraiser. Donations may be dropped off at the library on Thursday March 28th from Noon-6pm and on Friday March 29th from Noon-8pm or you can rent a booth space and sell your own treasures. Concessions will be available for purchase courtesy of the Friends of the Library. Proceeds from concession sales and items sold in the FOL booth benefit library programs. Limited spaces are still AVAILABLE! Start saving items to either donate to the FOL or sell in your own booth when they become available! Reservation forms are available here NOW! Click here for the reservation form. Reading the Terms & Conditions is a requirement to make a reservation. See the Terms & Conditions here. https://smile.amazon.com/ch/74-2911870 and support us every time you shop.